The moon will block Uranus like a game of cosmic peek-a-boo on Wednesday night (Sept. 10, 2014) for observers across northeastern North America. Positions of Uranus and the moon are shown in this Starry Night sky map. As the moon moves in its orbit around the Earth, it inevitably passes in front of many stars and planet and Uranus will find itself in the moon's crosshairs tonight (Sept. 10). When the moon passes in front of a star, known as a "lunar occultation," the star usually winks out instantaneously, since it is so much farther away. But there are exceptions when the star is a double star or, more rarely, when the star passes behind a mountain on the edge of the moon. The moon will block Uranus just around moonrise, so the earlier the moon rises in your location, the better your chances of seeing it. In most locations, Uranus will have passed behind the moon while the moon is still below the horizon, so only the reappearance of Uranus will be visible. For example, in Halifax, Nova Scotia, the moon rises at 9:24 p.m. ADT. 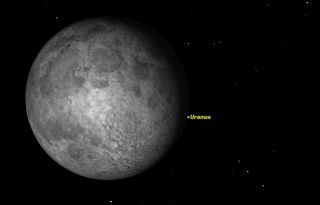 Uranus passes behind the moon at 10:00, when the moon is only 5 degrees above the horizon, next to impossible to observe. Uranus reappears nearly an hour later at 10:40. In New York City, the moon rises at 8:10 p.m. EDT but Uranus appears only 21 minutes later, at 8:31 p.m., when the moon is only 3 degrees above the horizon, a tough observation unless you have a really low eastern horizon. You can use a planetarium software program to give you the exact time when Uranus will be uncovered. This will also let you determine ahead of time exactly where on the moon's limb the planet will appear from your particular location. Since the whole event takes only 10 seconds, it's important to be looking at the right spot. Even if you live too far west to observe the actual occultation, this is an excellent opportunity to use Uranus' proximity to the moon to locate and observe Uranus. Again, your planetarium program will show you exactly where Uranus is located relative to the moon, which will vary from one location to another. Uranus is just at the lower limit of naked-eye visibility, but can be easily seen in binoculars. Even the largest amateur telescopes will show only a tiny featureless bluish disk. Editor's note: If you capture a photo of the moon and Uranus tonight, or any other night sky view, and would like to share it with Space.com, you can send images and comments in to managing editor Tariq Malik at: spacephotos@space.com. This article was provided to Space.com.com by Simulation Curriculum, the leader in space science curriculum solutions and the makers of Starry Night and SkySafari software. Follow Starry Night on Twitter @StarryNightEdu. Follow us @Spacedotcom, Facebook and Google+. Original article on Space.com.